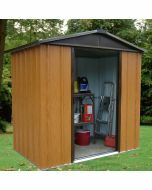 Yardmaster’s 64GPZ emerald pent metal shed easily accommodates all types of tools, bicycles and garden equipment. Made from hot dipped galvanise d steel, it’s green finish offers a tasteful and compact storage solution. 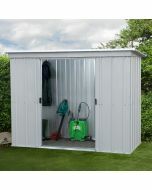 Yardmaster’s 6x4 emerald pent metal shed easily stores your garden equipment, bicycles and other household possessions. It's deep green finish offers a tasteful and compact storage solution for any part of your residential property. Generous headroom, roomy interiors and the double sliding doors make it easy to access your stored items. 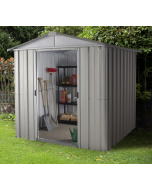 Made of high-strength, hot dipped galvanised steel with enhanced resistance to corrosion, warping, swelling and blistering, this metal garden shed is maintenance-free. The permanent, resin coated finish requires no touch ups, rust-proofing or application of any preservatives. Other than the occasional cleaning, it takes care of itself and your belongings. 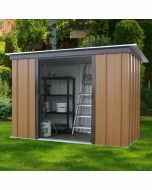 Designed with lockable handles that are attached with anti-tamper bolts, the Yardmaster metal garden shed provides secure storage on your property throughout the year. A free anchor kit is also included to secure it firmly to any kind of surface. 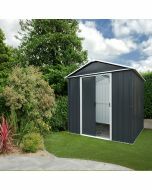 Backed by Yardmaster’s consistent quality and a unique 15-year anti-rust guarantee, this long-lasting shed is the perfect storage solution for your garden. Share your experience about Emerald Pent Metal Shed GPZ 6x4 with other customers. Submit your tips or thought on this product, be detailed and specific. 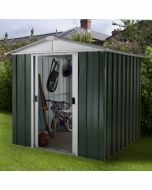 Why an Emerald Deluxe Metal Shed?